When discs degenerate, becoming less supple due to age or back strain, the disc may prolapse — squeezing out some of the soft core. This loss of cushioning may cause pressure on local nerves and cause back or neck pain, numbness or tingling in the arms, or searing pain down one or both legs. If the prolapse is severe it can damage the spinal cord. As a part of the aging process the discs lose their high water content and their ability to cushion the vertebrae. This is called degenerative disc disease. 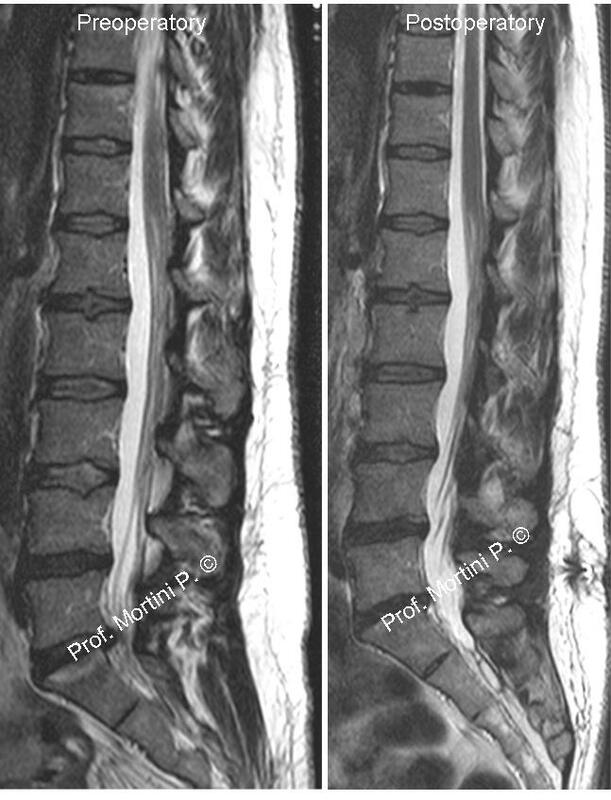 As the discs deteriorate, the spine can initially become less stable. Bony spurs can develop as a result of this instability and can cause pressure on nearby nerves leading to leg or arm pain. Narrowing of the neural canal by these bony spurs is known as degenerative spinal stenosis. • Sciatica — pain that starts near the back or buttock and travels down the leg to the calf or into the foot. • Spine x-rays are commonly taken after a neck injury in order to rule out a fracture, dislocation or instability. If the x-rays show degenerative changes right after the injury, then we assume they were present prior to the injury. Cervical spine x-rays may reveal congenital narrowing of the cervical spinal canal when present. Thoracic and lumbar x-rays may also show evidence of degenerative disease such as bone spurs and disc space narrowing. • CT scan of the spine is valuable in assessing bone injury, such as fracture and/or dislocation. Bulging or herniated discs may or may not be visible on CT scan, and may or may not be related to the patient’s symptoms. CT scan is most useful in showing bone structures, and is not as good as MRI in showing spinal cord, nerve roots or discs. CT scan does not show torn ligaments or minor tears of discs. • MR scanning (MRI) of the spine is the best method of imaging the spinal cord and nerve roots, the intervertebral discs, and the ligaments. However, MRI findings can only be of value when they are interpreted together with and in the light of the entire clinical picture, and exactly match the clinical findings. • Cervical myelography consists of x-rays taken after the injection of radio-opaque contrast material into the spinal fluid via a lumbar puncture, and is followed by post-myelogram CT scan of the spine (myelo-CT). It may provide useful images of the interior of the spinal canal, and can reveal indentations of the spinal fluid sac caused by bulging or herniated discs or bone spurs that might be pressing on the spinal cord or nerves. MRI provides superior images of the spinal cord, nerve roots and discs. • Electrodiagnostic studies(EMG and nerve-conduction velocities) are useful in evaluating weakness of hand and arm or leg muscles, and can indicate whether the weakness is due to abnormality or compression of a nerve root, or to some other cause.